I wanted to make an 1820s dress and I wanted to do a morning dress, because morning dresses kinda fascinate me. I knew it I was drawing a morning dress, than I would have to draw a cap. So, today’s 1820s morning dress was born. First thing, I kinda messed up. I wrote in my notes that the source image which I printed to draw from was from 1828, but actually it is from 1827. This error got repeated on the image of the dress, so I will fix it as soon as I have a chance, but that might be a while since I am traveling this week. 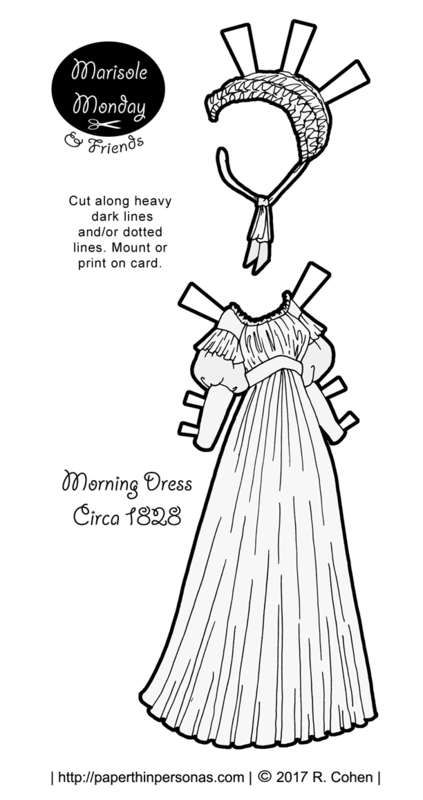 Anyway, here is the 1820s morning dress that I based today’s printable paper doll dress on from the Met. It had the most wonderful delicate flowers on it that I simply could not render to scale. Morning dresses were a private piece of clothing worn usually just for family members. They were classified as undress which was a least formal form of clothing in the 1800s. There was also half-dress and full-dress, if you’re interested. No lady would be seen without a hat of some kind and caps were basically indoor hats. I based the paper doll’s cap off one from the McCord Museum in Canada and you can see it here. Today’s dress from 1828 will eventually evolve into this style from 1830. The skirts will widen, the waist will drop and the sleeves will get yet bigger. The late 1820s is such an interesting period, because it is evolving into the 1830s. I hope everyone enjoys today’s foray into the late 1820s for a morning dress. Tomorrow, the week wraps with a sci-fi outfit. I keep reading this and adding a “u” into morning, and turning it into mourning dress, which has made it quite confusing. Yes. White was NOT a mourning color. I’ve never really drawn a mourning dress, perhaps I should. There were a LOT of rules to that.